Designed to be resistant to high temperatures and flames without limiting your dexterity, the Southcombe Firemaster Elite Gloves SB02279A offer a great level of protection for structural firefighting. 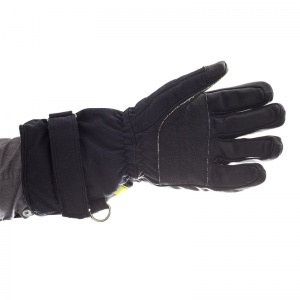 Made from high quality materials such as Kevlar and Pyrohide leather and accredited by EN 659, EN 388 and EN 407 standards, you can trust these gloves to be effective. The Southcombe Firemaster Elite Gloves are suitable for use by firefighters for structural firefighting, having been certified to EN 659. 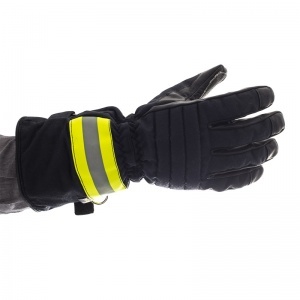 The gloves may also be suitable for other people who need protection against fire and extreme heat, depending on the specifics of the situation. Pyrohide leather is exclusively manufactured in the UK by Southcombe and is ideal for resistance against heat, fire, water, salt-water, liquid chemicals (including sulphuric acid, hydrochloric acid, caustic soda, ethanol et cetera) and Man Made Mineral Fibres (MMMF). 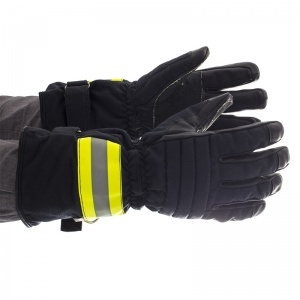 The Southcombe Firemaster Elite Gloves utilise pyrohide leather for greater general protection. Pyrohide is used by 48 out of the 61 fire brigades in the UK and retains tactile properties in dry or wet weather. Each Southcombe Firemaster Elite has a Kevlar lining that provides high levels of resistance against cuts or slashes and also prevents abrasion from damaging the glove. The Kevlar lining features cut and sewn cotton (35%), providing you with greater levels of comfort. On top of a lining and a shell, the Southcombe Firemaster Elite Gloves feature an interlining that offers better protection against heat. The interlining of the glove is a Gore Crosstech insert that is resistant to pathogens and liquid penetration against blood and bodily fluids. The Gore-tex membrane performs five times more efficiently than competitive polyurethane-based products. The interlining is chemically bonded to the lining, ensuring that they don't become inverted while in use. Knuckles are the area of your hands that are most at risk from impact threats and to protect against injury in this area, the Southcombe Firemaster Elite Gloves have a flame resistant 6mm closed cell expanded foam padding. 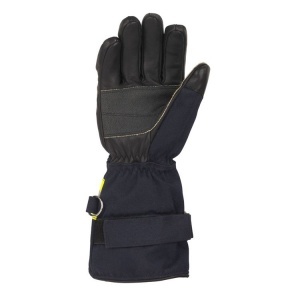 This padding provides you with a greater level of protection that does not have a negative impact in the amount of dexterity or flexibility that is offered by the gloves. Southcombe understands the problems that firefighters face on a daily basis and to ensure that you have the best protection, they have carefully designed the Firemaster Elite Gloves with certain features. Most notable, the gloves have a coated Kevlar patches on the palm and thumb, improving the resistance against contact heat and abrasion. Another feature is the 3M Scotchlite tri-band reflective strip across the back of the hand that provides greater visibility in low-light situations and is accredited to EN 471. Southcombe Firemaster Elite Gloves have been designed for high resistance against a number of threats including high temperatures, fire, cuts, punctures and abrasion. All of these resistances have been certified to EN standards, the results of which can be viewed below. It is crucial that if you are coming into contact with fire, you have gloves that can properly protect your hands from damage. The Southcombe Firemaster Elite Gloves have been rigorously tested to EN standards for heat and flame resistance, see below for more detail. Physical resistance can be as important to firefighting as resistance to flames and heat. The Southcombe Firemaster Elite Gloves have level of resistance against all physical hazards, which is great for ensuring that you don't have to worry about the gloves losing quality when in use. The Southcombe Firemaster Elite Gloves are available in six different sizes. To measure which size you need, please measure your dominant hand (whichever is larger) by making a fist and measuring the tape around the widest part (between your thumb and index finger). Refer to the table to discover the size of glove that is necessary. 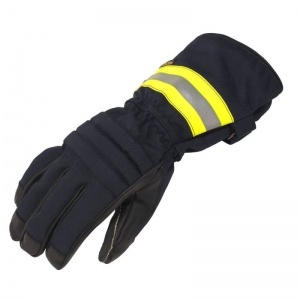 Southcombe Firemaster Elite Gloves are non-repairable and should be disposed of if damaged. The gloves do not require solvent based cleaners and should not be washed using cleaning agents of this type. Pyrohide leather is designed to dry quickly and remains soft and dexterous after washing.